Capable of filtering 20 liters with 1 filter. Pall AcroPak 12991 Capsule Filter, 0.8um prefilter followed by a 0.2um final filter to help prevent premature clogging. 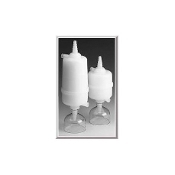 Pall AcroPak 12991: AcroPak 500cm2 Filter Capsules, 0.8um prefilter/0.2um final filter made of the Supor hydrophilic polyethersulfone membrane. Constructed with a filling bell. Gamma-Sterilized.